Multiprocessor is one which has more than two processors in the system. We have two categories of multiprocessing systems, that are loosely coupled and tightly coupled multiprocessor system. The degree of coupling between the processor is low in loosely coupled system whereas, the degree of coupling between processors in the tightly coupled system is high. The basic difference between the loosely coupled and tightly coupled multiprocessing system is that loosely coupled system has distributed memory whereas, the tightly coupled system has shared memory. Let us discuss some more differences between loosely coupled and tightly coupled multiprocessing system with the help of comparison chart shown below. Basic Each processor has its own memory module. Processors have shared memory modules. Efficient Efficient when tasks running on different processors, has minimal interaction. Efficient for high-speed or real-time processing. Memory conflict It generally, do not encounter memory conflict. It experiences more memory conflicts. Interconnections Message transfer system (MTS). Interconnection networks PMIN, IOPIN, ISIN. Expensive Less expensive. More expensive. Multiprocessor is one which has more than two processors in the system. 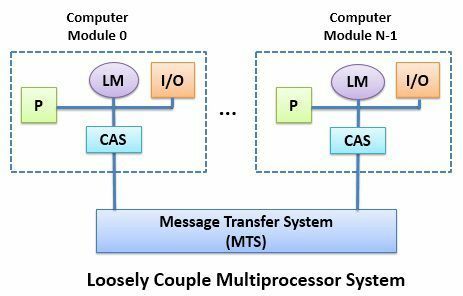 Now when the degree of coupling between these processors is very low, the system is called loosely coupled multiprocessor system. In loosely coupled system each processor has its own local memory, a set of input-output devices and a channel and arbiter switch (CAS). We refer to the processor with its local memory and set of input-output devices and CAS as a computer module. Processes that execute on different computer modules communicate with each other by exchanging the messages through a physical segment of message transfer system (MTS). The loosely coupled system is also known as distributed system. The loosely coupled system is efficient when the processes running on different computer module require minimal interaction. If the request fo accessing MTS of two or more computer module collide, the CAS responsibly chooses one of the simultaneous requests and delay other requests until selected request is serviced completely. The CAS has a high-speed communication memory which can be accessed by all the processors in the system.The communication memory in CAS is used to buffer the transfers of messages. The throughput of the loosely coupled system may be too low for some of the applications that require fast access time. In this case, Tightly coupled microprocessor system must be used. The tightly coupled system has processors, shared memory modules, input-output channels. The above units of the tightly coupled system are connected through the set of three interconnection networks, processor-memory interconnection network (PMIN), I/O-processor interconnection network (IOPIN) and the interrupt-signal interconnection network (ISIN). The use of these three interconnection networks is as follow. PMIN: It is a switch which connects each processor to every memory module. It can also be designed in a way that a processor can broadcast data to one or more memory module. ISIN: It allows each processor to direct an interrupt to any other processor. IOPIN: It allows a processor to communicate with an I/O channel which is connected to input-output devices. The key difference between loosely coupled and tightly coupled system is that loosely coupled system has distributed memory, whereas, the tightly coupled system has shared memory. Loosely coupled is efficient when the tasks running on different processors has minimal interaction between them. On the other hands, the tightly coupled system can take a higher degree of interaction between processes and is efficient for high-speed and real-time processing. The loosely coupled system generally do not encounter memory conflict which is mostly experienced by tightly couples system. 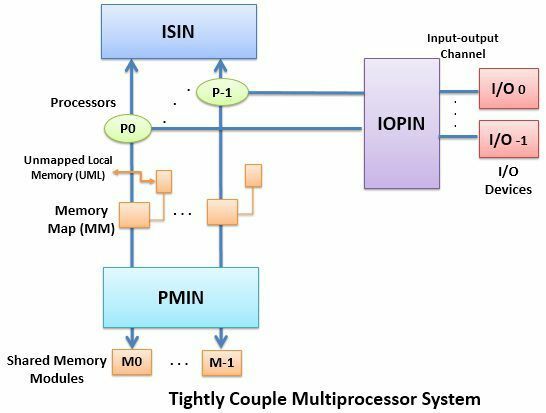 The interconnection network in a loosely coupled system is Message Transfer system (MTS) whereas, in a tightly coupled system the interconnection networks are processor-memory interconnection network (PMIN), I/O-processor interconnection network (IOPIN) and the interrupt-signal interconnection network (ISIN). The data rate of the loosely coupled system is low whereas, the data rate of the tightly coupled system is high. The loosely coupled system is less expensive but larger in size whereas, the tightly coupled system is more expensive but compact in size. The loosely coupled system has a distributed memory which delays the data rate whereas, the tightly coupled system has shared memory which increases the data rate. very neat and compact answer.